Need Acoustic Ceiling Removal? Call Our Popcorn Ceiling Removal Experts! 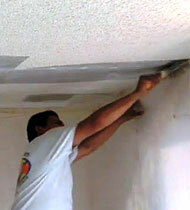 One of the easiest ways to increase interior aesthetic of your home is to get outdated popcorn ceiling texture removed! We specialize in the removal of what is commonly called popcorn or cottage cheese ceilings. They date your home and have health considerations, as well as reduce its value upon resale. While you may think about doing it yourself or hiring the guy down the street to tackle it, make sure you consider the pros and cons of this option. You may save a few dollars at first, but what about long-term costs you will face if your ceiling is damaged and a mess made of your living area? When you call on Quality Interiors Professionals to handle your acoustic ceiling removal, you can be confident knowing we’ll get the job done right—the first time. Our professionals know how to perform quick and efficient removal and can make correct repairs to damaged areas. When we come in Quality Interiors preps your home air tight. Then we spray (water) the affected areas to moisten the popcorn and then scrape it off leaving the unvarnished drywall and ready for the next step in beautifying your home.